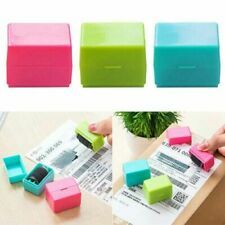 Easy to re-ink or replace ink pad. - Full size label on top for easy identification. - Many years of trouble free operation. One swipe and the info is covered, no need to go for a shredder. Ink pads are replaceable and re-inkable with ExcelMark self-inking ink. 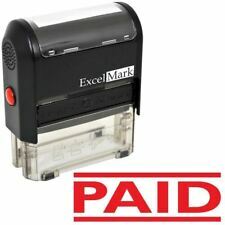 Stay organized and ensure efficient communication with the use of this PAID self-inking rubber stamp from ExcelMark. The self-inking design automatically re-inks itself into a rotating, self-contained ink pad before each impression, making it ideal for rapid, repetitive stamping. Made of durable plasitic, this Mini Date Stamp is versatile, lightweight and is an economical option for occassional dating needs. This date stamp is also re-inkable for the useful life of the dater, making this an exceptional value. JYP PA1040 Pre-Inked Rubber Stamp. Easy, fast, unlimited refill. Stamp Text Say: Fragile Handle With Care. Ink Color: Red. text plate size: 5/16" X 1-1/2". Elegant and comfortable handle design. 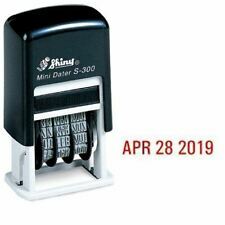 Made of durable plastic, this Mini Date Stamp is versatile, lightweight and is an economical option for occasional dating needs and is re-inkable for the useful life of the date, making this an exceptional value. Handle marks text orientation. You will receive: 1 Date Stamp with Ink Pad. Compact and lightweight. Easy to set. Roller design, easy to use. Color: Random Color. We will do our best to reduce the risk of duties. Exquisite shape, popular edge. Size: Approx.6 x 3 x 3cm. 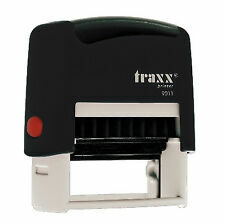 TRAXX 9013 SELF-INKING. They have been tested for over 100,000 impressions. They are easy to use and the easiest to re-ink, with a convenient slide out ink pad. They re-ink with regular rubber stamp ink, no special inks are required, and perform for thousands of stampings between re-inkings. JYP PA1040 预着墨橡皮戳. 免费送货48个国家。. 我们接受安全贝宝付款。. 我们也接受您的贝宝帐户付款。. 我们不向阿拉斯加，夏威夷和波多黎各发货。. 所有 星期六， 星期天或假日 收到的付款 ，然后订单将在2个工作日后发货。. 所有星期五收到的付款，那么订单将在下周一发货。. 5 out of 5 stars - JYP PA1040 Pre-Inked Rubber Stamp with "Paid and Date"
1 product rating1 product ratings - JYP PA1040 Pre-Inked Rubber Stamp with "Paid and Date"
Orders submitted without color or font will be done in Black and Swiss. Ink colors available: black, red, blue, green, brown, purple, pink and orange. IMPRESSION SIZE: 28 mm x 5 mm (Length x Height). 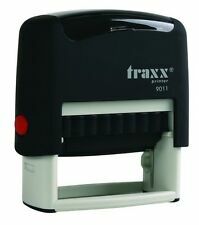 1 x Office Date Stamp with 1 x Black Ink Pad Included. to cause cancer and birth defects or other reproductive harm. Compact, Lightweight, Easy to carry. Roller design, easy to use. Material: Plastic. Size: Approx.6 x 3 x 3cm. Quantity: 1Pc. Exquisite shape, popular edge. Made of high quality material, more durable. 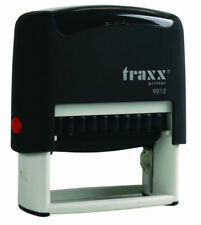 2000 Plus Printer 40 Self Inking Stamp. Orders submitted without color or font will be done in Black and Swiss. Ideal 1oz Refill Ink Bottle. * FRAGILE * Stamp Pre-inked stamp, Red Ink New Included Free Shipping. JYP PA1040. Stamp Text: Do Not Bend. Pre-Inked Rubber Stamp. Stamp Text Size: 5/16" x 1-1/2". Elegant and comfortable handle design. Ink Color: Red. Easy, fast, unlimited refill. 5 out of 5 stars - JYP PA1040 Pre-Inked Rubber Stamp with "Do Not Bend"
12 product ratings12 product ratings - JYP PA1040 Pre-Inked Rubber Stamp with "Do Not Bend"
JYP PA1040 Pre-Inked Rubber Stamp. text plate size: 5/16" X 1-1/2". 5 out of 5 stars - JYP PA1040 Pre-Inked Rubber Stamp with "Return To Sender"
11 product ratings11 product ratings - JYP PA1040 Pre-Inked Rubber Stamp with "Return To Sender"
Includes: 1 x Date Paid Stamp. Stamp Model: IDEAL 4911. This IDEAL 4911 self-inking stamp is mainly used to stamp the back of checks. Actual Stamp Impression Size: 1-7/16"w by 3/16"h. Stamp Ink Color: Black Ink. "FOR DEPOSIT ONLY". JYP 4911R-01. 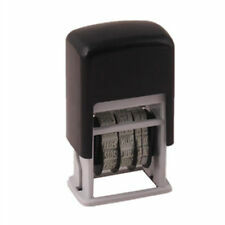 Self Inking Rubber Stamp. Easy, Fast, Unlimited Refill. STAMP TEXT text plate size: 3/5" x 1-1/2" (15 x 38 mm). PAID/CASH/CHECK/CREDIT. Shiny S-852 Self-Inking 3 Line Custom Stamp. Orders submitted without color or font will be done in Black and Swiss. Ink colors available: black, red, blue, green, brown, purple, pink and orange. Stamp Model: IDEAL 4911 Self-inking Stamp. This IDEAL 4911 self-inking stamp will give you up to a few thousand high-quality. "NON MACHINABLE. will indicate that the envelope is "non machinable" and is processed manually. Ensure efficient communication and provide clear instructions with the use of this PAID self inking rubber stamp. This stamp is ideal for rapid, repetitive stamping because the die automatically re-inks itself by rotating into a self-contained two-sided ink pad. Compact print pad contains a special inking solution that wipes away clean. Inkless fingerprints pads are an easy and inexpensive way to provide extra security and to prevent check and identity fraud. JYP PA1040. Easy, fast, unlimited refill. Stamp Text:For Deposit Only. Pre-Inked Rubber Stamp. Ink Color: Red. text plate size: 5/16" x 1-1/2". Stamp Model: IDEAL 4911. This IDEAL 4911 self-inking stamp will give you up to a few thousand high-quality. Impression Size: 1-7/16"w by 3/8"h. Stamp Ink Color: RED. from Rubber Stamp Man LLC - On the Web Since 1998. JYP PA2060 Pre-Inked Rubber Stamp "Paid CK No.,Amount , Date and Line"
Stamp Text: Paid ,CK# No., Amount, Date. Easy, Fast, Unlimited Refill. Pre-Inked Rubber Stamp. Ink Color: Red. text plate size: 3/4” x 2-9/32” (20 x 60 mm). Black Ink Pad. Swift Variety. Excellent Service. High quality trodat refill ink Overview. Ensure efficient communication and provide clear instructions with the use of this SCANNED self-inking rubber stamp. This stamp is ideal for rapid, repetitive stamping because the die automatically re-inks itself by rotating into a self-contained two-sided reversible ink pad. JYP PA1040 预着墨橡皮戳. 免费送货48个国家。. 我们接受安全贝宝付款。. 我们也接受您的贝宝帐户付款。. 我们不向阿拉斯加，夏威夷和波多黎各发货。. 所有 星期六， 星期天或假日 收到的付款 ，然后订单将在2个工作日后发货。. 所有星期五收到的付款，那么订单将在下周一发货。. 所有在东部时间下午4点后收到的付款，然后订单将在2个工作日后发货。. Depending on your location. Not for use on glossy or coated papers as oil based ink may rub off. Ensure efficient communication and provide clear instructions with the use of this self inking rubber stamp. This stamp is ideal for rapid, repetitive stamping because the die automatically re-inks itself by rotating into a self-contained two-sided ink pad. Stamp Model: IDEAL 4911. This IDEAL 4911 self-inking stamp will give you up to a few thousand high-quality. Actual Stamp Impression Size: 1-7/16"w by 1/2"h. Stamp Ink Color: Black Ink. "FOR DEPOSIT ONLY". Ensure efficient communication and provide clear instructions with the use of this COPY self inking rubber stamp. This stamp is ideal for rapid, repetitive stamping because the die automatically re-inks itself by rotating into a self-contained two-sided ink pad. Comfortable SureGrip handle. Re-inkable for hundreds of thousands more impressions. This identity theft protection stamp eliminates the need for a noisy and expensive shredder, or can be used in conjunction with a shredder for added security. 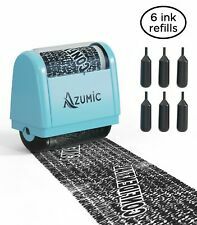 Make your personal information illegible with this self inking roller stamp. Stamp Model: IDEAL 4911. This IDEAL 4911 self-inking stamp will give you up to a few thousand high-quality. Impression Size: 1-7/16"w by 1/2"h. Stamp Ink Color: BLACK. from Rubber Stamp Man LLC - O n the Web Since 1998. Heavy Duty Stapler. LEVER ACTION CRAFT PUNCH. 1.5" POP UP CRAFT PUNCH. LEVER ACTION BORDER PUNCH. LEVER ACTION DEEP BORDER PUNCH. LEVER ACTION CORNER PUNCH. SCREW HOLE PUNCH. 1.5" LEVER ACTION CORNER PUNCH.